A Polish poet, literary expert, translator of contemporary American, English and Irish poetry (e.g. Frank O'Hara, Charles Reznikoff, John Ashbery, Kenneth Koch, Robert Lowell, Derek Mahon, Seamus Heaney), the author of poems for children, anthologies with translations, an editor of the Literatura na Świecie magazine. He debuted in 1977 with a poetry volume W krześle [In the Chair]. 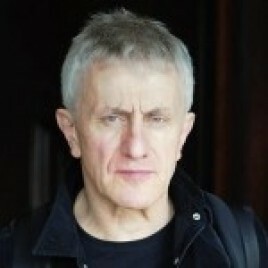 He has received many awards, including the Kościelscy Foundation Award (1988) and the Silesius Wrocław Poetry Award for his entire literary work (2010). In 2010, he was nominated for the Nike Literary Award. He is the author of many poetry volumes, including: Pamiątki po nas [Our Relics, 1980], Przed snem [Before Sleep, 1981], Kolejny świat [The Next World, 1983], Czynnik liryczny i inne wiersze (1980-1986) [Lyrical Factor and Other Poems, 1988), Smak detalu i inne ogólniki [The Taste of Detail and Other Generalities, 1995], Piosenka pasterska [The Shepherd’s Song, 1999], Dni i noce [Days and Nights, 2009], Wiersze ze słów [Poems from Words, 2009]. In 2010, a volume of his texts on literature was published under the title Ucieczka w bok. Pytania i odpowiedzi [Escaping Aside. Questions and Answers]. He lives in Sulejówek near Warsaw.